A report on the future of policing has said the number of officers in England and Wales will have to be reduced. The review was carried out by the Chief Inspector of Constabulary, Sir Ronnie Flanagan, who said more tasks should be performed by support staff. He proposes cuts to bureaucracy to make the police more effective. It came as the home secretary scrapped forms recording stop and account incidents in three areas, and across England and Wales by the end of 2008. At a briefing, Sir Ronnie Flanagan predicted that financial settlements for the police over the next three years would be tight. With workforce costs taking up 80% of police budgets, he said that maintaining police numbers at their current level was not sustainable. Launching the report, he said there would be a slight reduction but refused to say how many of the 141,000 posts would go. Jobs such as staffing the front desk of police stations and processing suspects in custody suites could be carried out by non police officers, he said. In the review, Sir Ronnie also called for a total overhaul of stop and search, and the way it is recorded. He also said police did not need to collect the same amount of paperwork for a broken window as a murder. All projections suggest they can save at least five million man hours a year by cutting red tape - the equivalent of 2,500 officers - Sir Ronnie said. Chairwoman of the Police Federation Jan Berry said taken as a whole the report could put a lot of police officers back on the street. But she warned, reducing the jobs police did could lead to a "de-skilled" force if the police role became purely "confrontational". "It produces a completely different kind of police service, one that's only dealing with confrontational situations, like a paramilitary force," she said. "That's not the police service that traditionally this country had, and we have got to be very careful before we fall into that type of police service." The report says that when support staff are trained to carry out duties, such as taking statements, the evidence suggests they do so "more effectively", and that "further work" is needed to explore this approach. 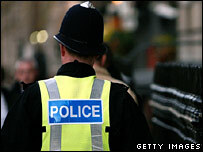 Unison, which represents 40,000 civilian - or police staff - says it welcomes proposals to use the skills of its members. "Instead of spending time filling in forms, officers will now have more time doing what they are paid to do - catching criminals and keeping our streets safe." The president of the Association of Chief Police Officers, Chief Constable Ken Jones, welcomed the report saying Sir Ronnie had "laid down the gauntlet to all those involved in the leadership and governance of policing". "Acpo is determined to pick up this opportunity and to do all we can to make neighbourhoods as safe and secure as possible while confronting the threats we face from organised crime and terrorism," he said. Civilian staff can take care of all paper work done by police officers. They can provide support to police officers on the beat by staying in contact with them on radio/phone. "The linchpin of effective policing was and will remain the constable. In the policing context the sworn officer is our 'GP'. "The review is sensibly suggesting ways in which we can better support sworn officers. It is not advocating reduction or replacement." In his report, Sir Ronnie also calls for a "radical overhaul" of police station reception areas and the service provided to the public. "Dingy surroundings, out-of-date posters and poor or slow service," he said, "have a negative impact on public satisfaction and confidence." The report also criticises the Home Office. It describes the decision to withdraw funding from the national non-emergency telephone number, 101, as "deeply regrettable".